PalmSHIELD is excited to have been a part of an important occasion in Allentown, Pennsylvania as the city opened their first medical marijuana dispensary in mid-June of this year. 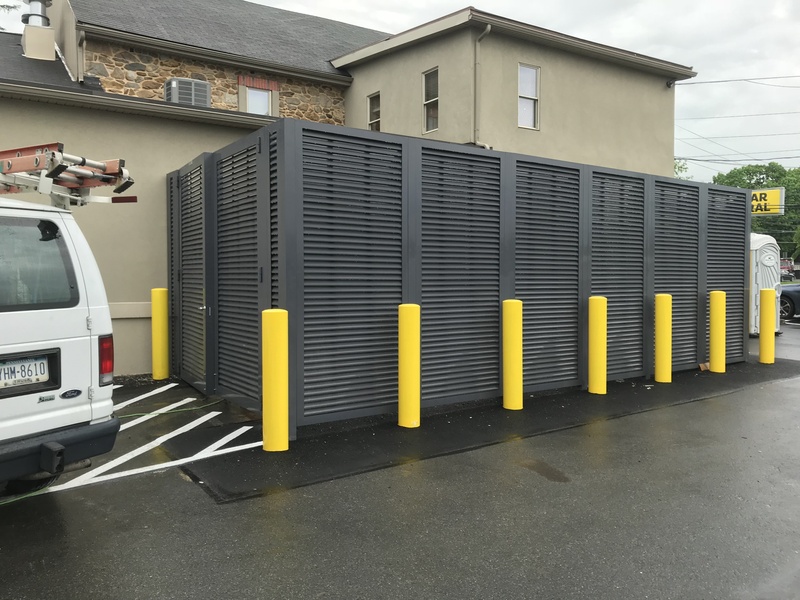 A PalmSHIELD horizontal louvered enclosure stands proudly at Mission Dispensary and was installed by ProMax Fence Systems. The mechanical equipment screening fits in very nicely with the building’s cool tones and attractive design. ProMax Fence Systems has worked on several projects involving PalmSHIELD products in the past and has virtually become an expert at installing our products. As is obvious from their finished product at Mission Dispensary, they do masterful work. Due to its size and sturdy design, the Mission Dispensary project uses an internal locking device and Gorilla hinges. Made for large, industrial gates, the Gorilla hinges use a half inch mounting plate, a butterfly design and bolt holes tapped and pre-drilled. PalmSHIELD’s one-of-a-kind panel designs and the industry’s largest louver have helped us become the leader in mechanical equipment screening. 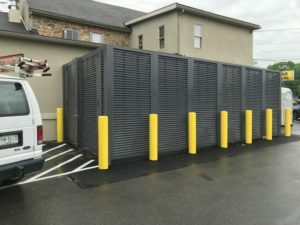 The screening and enclosure options we offer go even further than horizontal louvered enclosures, including perforated screening, vertical louvers, wire mesh, rooftop and self-standing screening. Please visit us at PalmSHIELD today if you have any questions or inquiries or to see the wide variety of options PalmSHIELD has to offer.